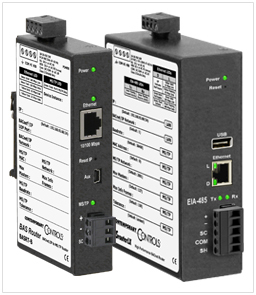 August 2014 - Connecting our low-cost, standalone BACnet® routers to your MS/TP networks lets you free up your building controller's MS/TP communications - freeing up your building controller's CPU for other activities. CPU usage is decreased by offloading the MS/TP token passing to our external BACnet MS/TP to BACnet/IP routers. This is especially important if you require the building controller to be connected to multiple MS/TP networks. In addition, freeing up CPU usage allows you to use smaller or fewer building controllers and eliminates the need for MS/TP drivers. Both our BAS Router - BACnet Multi-Network Router and BASrouterLX - High-Performance BACnet Router provide the solution. The units offer stand-alone routing between BACnet networks such as BACnet/IP, BACnet Ethernet, and BACnet MS/TP - allowing the system integrator to mix BACnet network technologies within a single BACnet inter-network. In addition, the BASrouterLX provides a high-speed processor, with advanced features that include MS/TP slave proxy support (allowing auto discovery of MS/TP slaves), MS/TP frame capture and storage for use with Wireshark®. Up to 50 BBMD entries can be made. Cost-savings provided by the convenient integration to BACnet/IP networks. Instead of running MS/TP cables to building controllers, you can run each MS/TP network to the nearest Ethernet drop. Contemporary Controls' BACnet routers can make the final 10/100 Mbps Ethernet connection. Take advantage of the building's Ethernet network when integrating MS/TP field devices to BACnet/IP. Visit our BASrouters page for more information.